_Read Ian White's groundbreaking and enlightening book, written after his intensive 10 year research into why depression is now a 'sentence' rather than a 'word.' ... and it should only be an inoffensive word - not a life sentence! So ... White writes, "the World Health Organization predicts that by the year 2020, depression will be the second leading cause of disability throughout the world, and its researchers estimate that 178 million people are currently (in 2012) suffering from depression." Is this not a global catastrophe? Was Leonard Cohen correct when he said, "The term clinical depression finds its way into too many conversations these days. One has a sense that a catastrophe has occurred in the psychic landscape"? Are there REALLY myths associated with the condition of depression? We do not say that it "doesn't exist." - Far from it. Everybody's experience of pain and discomfort is real. But there are now, and have been for decades, moves afoot to build a world-view about depression that serves only a few, and not those who need the help most. 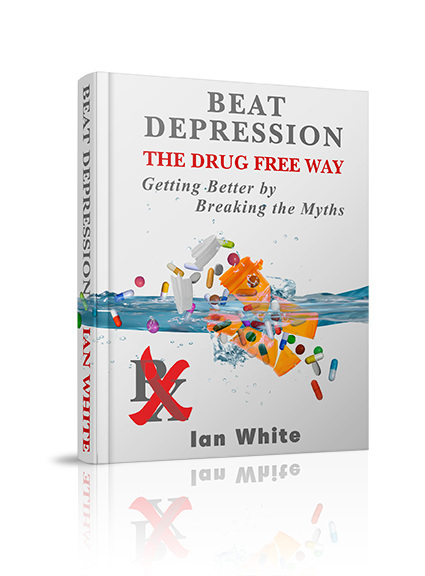 The myths are examined in this book "Beat Depression the Drug Free Way.." with the benefit of a decade of research and questioning by Ian White, developer of Af-x and Affectology. There is no doubt that the reader will emerge from this book's pages wiser and with a commonsense and exacting view of the depression 'facts' in which our society is awash. Do you have the sort of depression that the myth-makers claim? Or can you change things from an intelligent perspective of what's REALLY going on? AND!! Purchase the book and you will now receive the extra BONUS WORKBOOK "Unlock Your Depression and be Free" to help you further along your path! _This workbook compacts several decades of experience in affective psychotherapy (Af-x), specializing in attributional depression, into 39 pages of important PRACTICAL advice and accompanying insight mindfulness exercises. It takes readers through the easy proven stages that thousands of Af-x clients have undergone to banish the curse of depression. It’s packed with powerful ‘help for self-help’. You are not left to simply read and work these through. Embedded mp3 sound files guide you through the stages of mindfulness, needed to change your subconscious depression drivers forever! What could be easier? … Read for a while - listen for a while. You can end depression through these mindfulness exercises, and never go back! 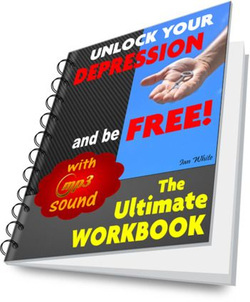 Unlock Your Depression And Be Free: The Ultimate Workbook comes automatically along with Beat Depression the Drug Free Way, as a bonus eBook, downloadable from the same source when you click the ‘Add To Cart’ button. Beat Depression the Drug Free Way (left) comes with this bonus Workbook with mp3 sound files. The workbook builds on the content of the "Beat Depression" fact book in a way that helps depression sufferers through mindfulness exercises to modify subconscious causal belief systems. Dr Ioannis Dovelos, Director of the Applied Psychotherapy & Counselling Centre in Athens, Greece.